This continues to amaze me... The volatility index trading under 20 while so much is going on in the world. From turmoil in the middle east (which now seems to be escalating beyond Libya, Egypt and Tunisia) to the nuclear crisis in Japan with toxic radiation jeopardizing not only the environment and on a humanitarian level but also economic situations that seem to be spreading globally. On top of that, there is still the emerging markets putting pressure on the global economy and somehow the VIX seems to be trading below 18. This really puzzles me. And if anyone thinks he or she has a logical answer to this, feel free to reply to this post. I'm dying to hear what anyone else has to say about this since it's nowhere addressed really on any of the major financial news agencies. 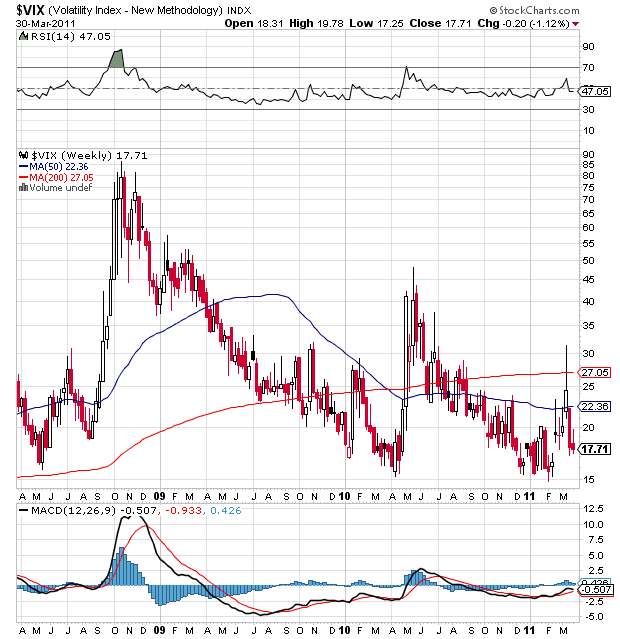 I pretty much started full time trading and my interest in it during, and a bit after the 'great recession', so for me I'm not really used to see the VIX trading anywhere under 20. (it topped 90 at one time in Nov of 08). The recession on Wall Street may be over, but Main Street sure still feels the pinch. So again, if anyone can explain this phenomenon please let me know, I'm curious to see what you have to say about this. For now, I just can't resist to be bearish on the VXX, an aggressive Call 35.00 strike price by April 16th, and judging by the open interest I'm the only one that believes this is a good Call.